Ted Cruz: Something Something NFL Kevin Bacon - Joe.My.God. Texas Sen. Ted Cruz used a tweet from actor Kevin Bacon to take a shot at his Democratic opponent in the 2018 midterm election on Thursday. 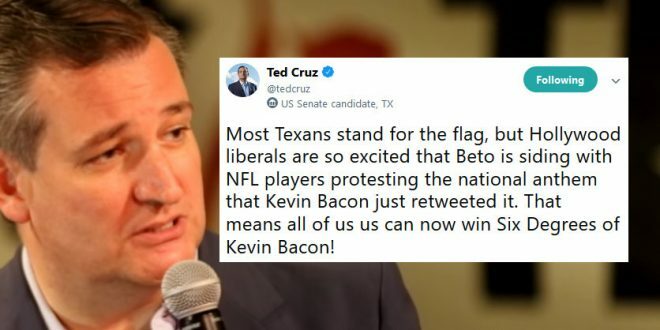 Bacon, well known for his roles in movies such as “Footloose,” shared a viral video on Twitter of Beto O’Rourke, a congressman from El Paso vying for Cruz’s Senate seat, telling voters why he supports NFL protests during the national anthem. Cruz argued that while Hollywood might like this sort of video, most Texans would not. As Texas Democrats attempt to win a major statewide contest for the first time in almost three decades, a new NBC News/Marist poll finds Democrat Beto O’Rourke trailing Republican Sen. Ted Cruz by just 4 percentage points.